It only seems like yesterday that we celebrated last Christmas doesn't it? 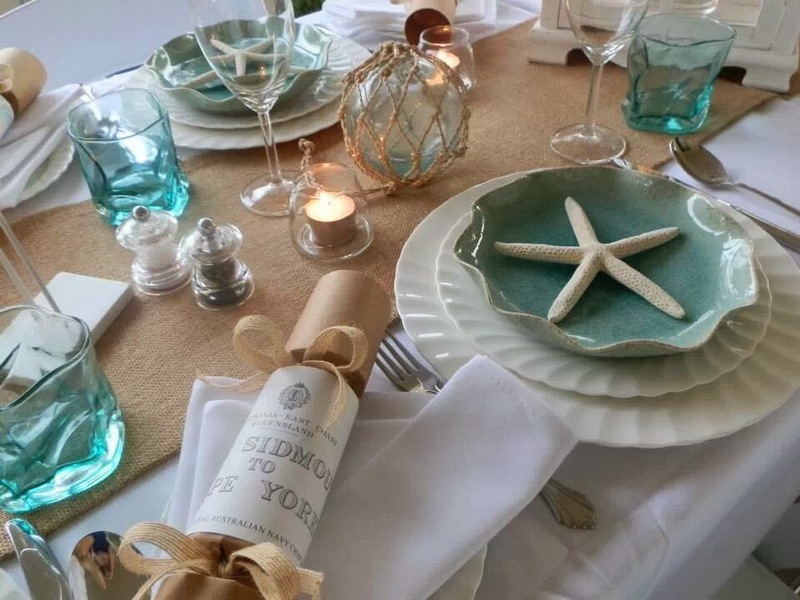 If you've been following my blog from day dot, well you may remember my very first post this year and this gorgeous Coastal Christmas table created by an old friend & neighbour of mine Shelby. Not long after I opened last year, Shelby purchased some old glass floats & blue bottles, and a vintage nautical chart of the Great Barrier Reef. 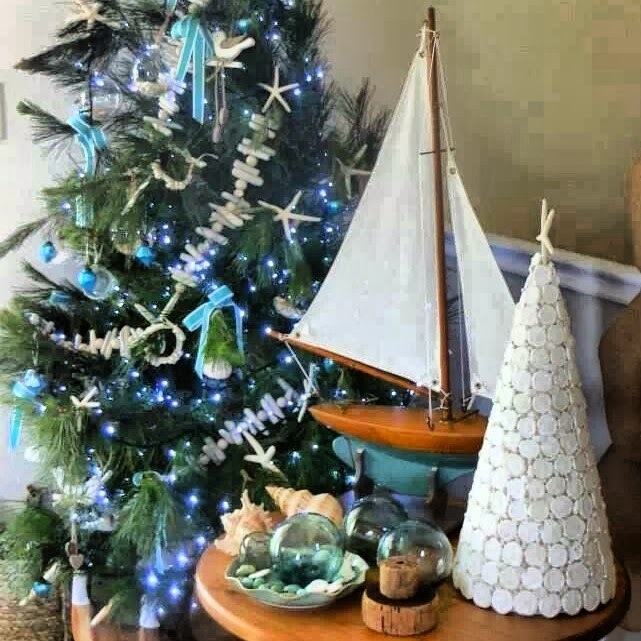 She told me that she was going to do a coastal theme Christmas and this is what she created. 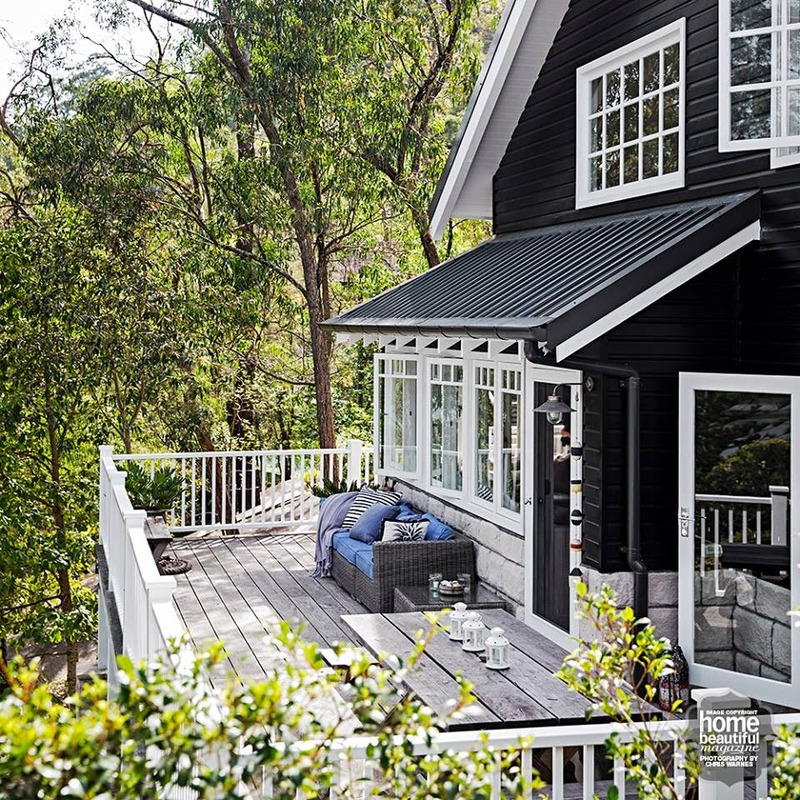 Firstly, I love al fresco dining and this beautiful setting is perfect for an Australian Christmas. Secondly, the starfish are striking on the gorgeous blue 'Lotus' plates aren't they? Shelby bought these online from the fabulous American shop Anthropolgie. In the middle of the table, Shelby has used a hessian runner that she whipped up. I'm useless with a needle so if I was to recreate, I may use brown paper. These are similar glass floats that Shelby has used on the table. 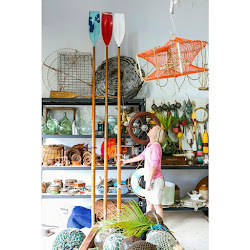 They are all authentic vintage fishing floats that were once used to hold up fishing nets. Click here to take you to the website to see what glass floats are available. 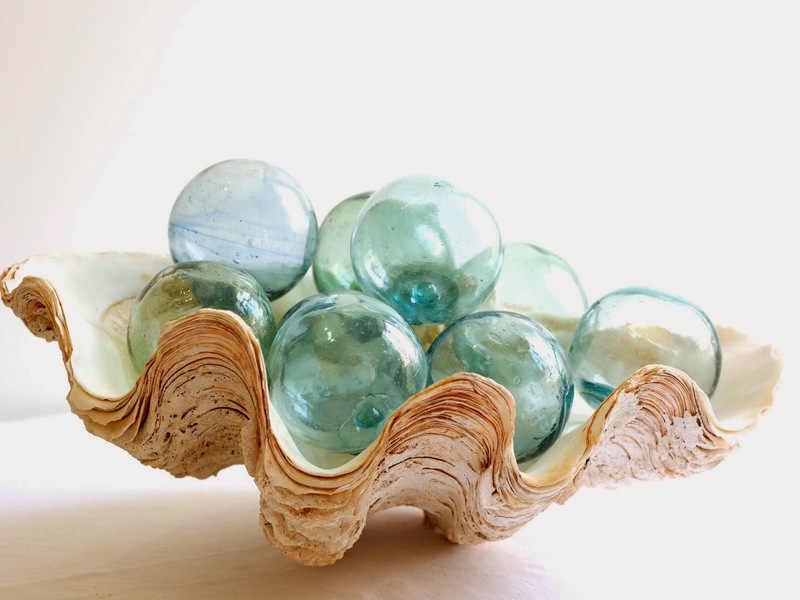 A beautiful old clam shell would make a stunning centrepiece and it could be filled with glass floats, prawns or perhaps sand with candles. Click here to see the range of clam shells we have available. Shelby bought plain bonbons** and replaced the insides with lindt chocolates & a scratchie (lottery ticket) and then used an old nautical chart to decorate the middle. I haven't the heart to cut up an old chart but I certainly could trace an old chart and colour it in to create this look. Click here to see the vast range of old nautical charts in-store. Isn't this Christmas tree just glorious? Shelby has used driftwood garlands that you could easily make using pieces that you have found or perhaps make one with shells, or driftwood & shells. To complete the look tie some blue ribbons, add some starfish and string blue fairy lights. And we have quite a few fishing corks too that will be added to the website in November. 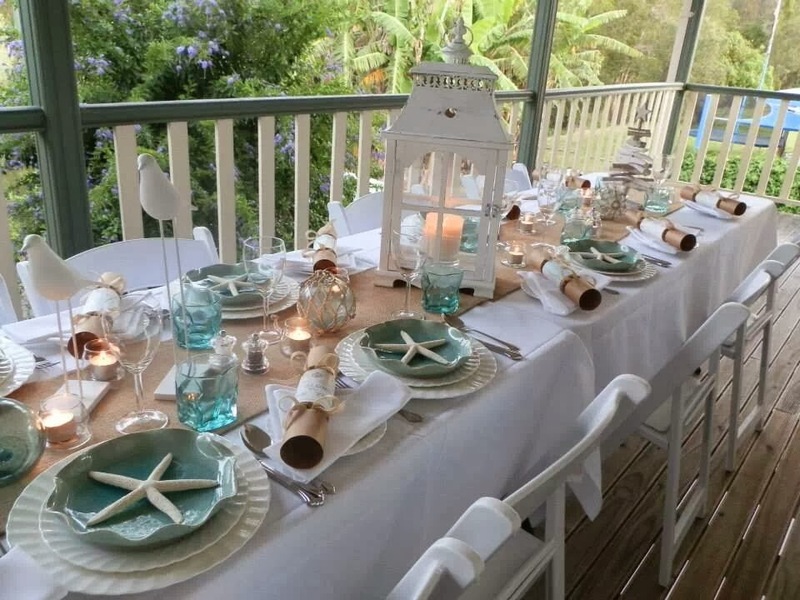 This coastal vintage style Christmas table theme could be used for many occasions minus the Christmas bon bons. 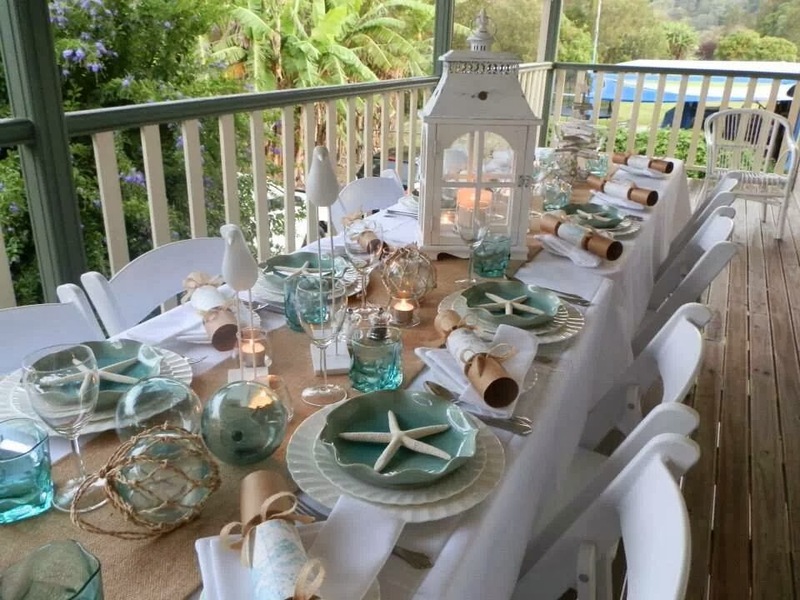 It could be recreated for a beach wedding or a coastal luncheon, or why not a coastal theme high tea. Thanks for the gorgeous inspiration Shelby. After I return from holidays in November, I will write a post about some other coastal vintage ideas for Christmas & the festive party season. 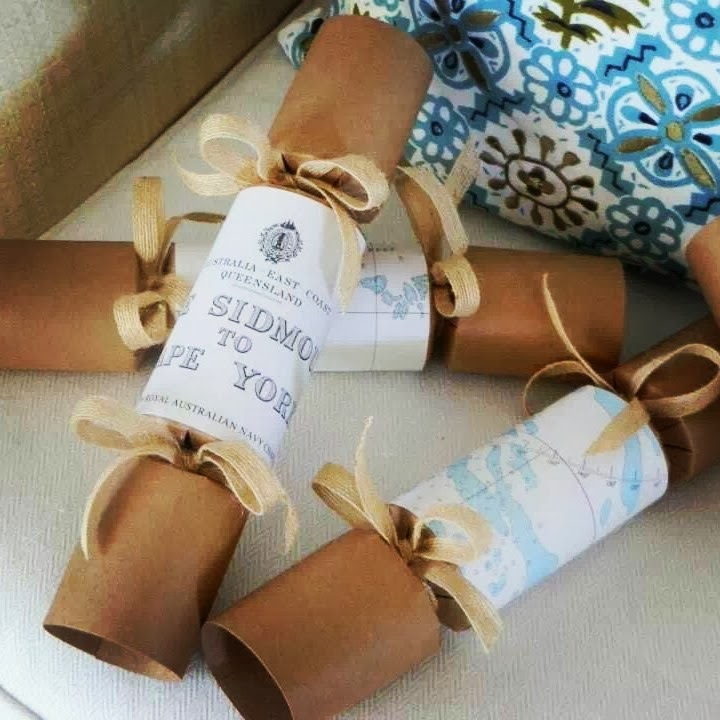 ** bon bons are Australian Christmas Crackers. A person holds the bon bon at each end & pulls the bon bon until it cracks open with a crackle pop, and inside is a little surprise. 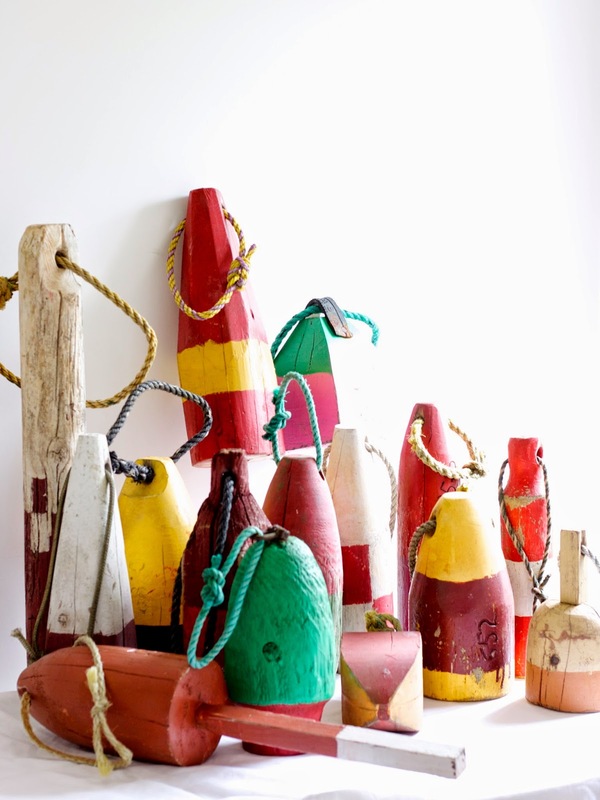 Do you know much about wooden lobster pot buoys? Well here is a little history. Wooden lobster pot buoys are a type of float that is attached to a cane pot/trap in order for lobstermen to be able to identify their traps which have been set on the ocean floor. The buoy is attached to the trap and it floats on top of the water enabling the lobstermen to locate his pot/s easily. To identify their buoys the lobstermen have their own colour scheme. This is required by law and many mark their buoys with their initials or names, and also license numbers. No two lobstermen can have the same colour scheme, pattern or numbers. 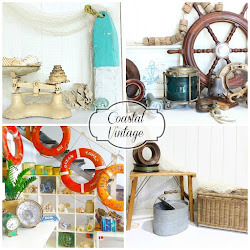 Vintage paddles & oars are a particularly popular item that I sell here at Coastal Vintage. I can never stock enough. There is something about paddles & oars aren't there? That connection to the water and being on the water. 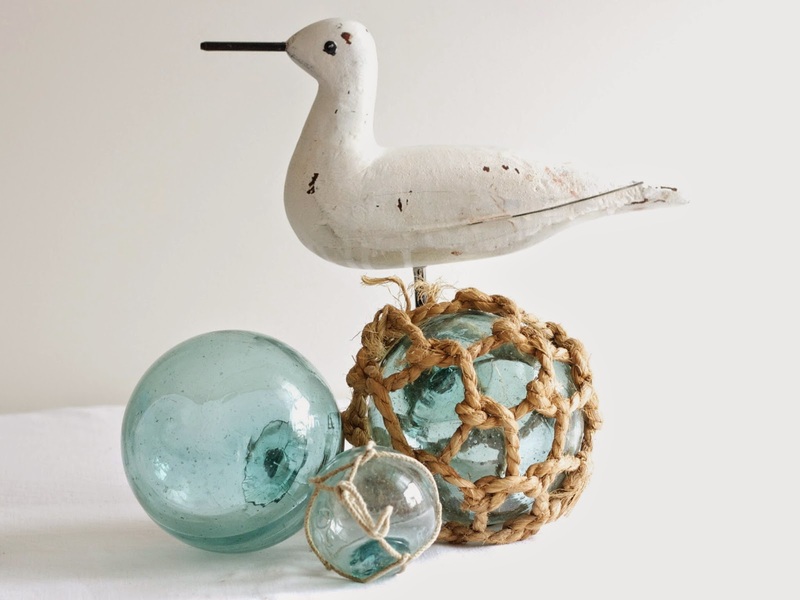 And they are fabulous items to display in the home - particularly a coastal home or a beach shack! And as I find paddles and oars for the online store, some need a make-over. 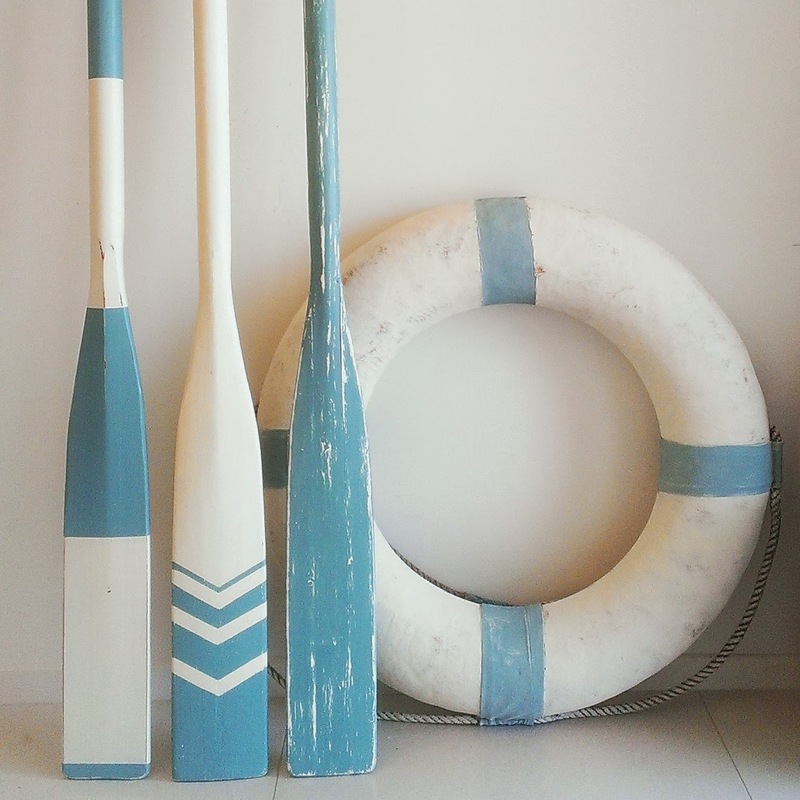 Keeping in with the coastal theme, all the paddles & oars I have done so far have been painted in white & blue. Old paddle painted with chalk paint, sanded to give a distressed look and waxed. Looks great doesn't it? A paddle painted white first, then taped two rows at bottom & painted blue over the top. Took the tape off to reveal to white stripes. Looks lovely with the old lobster buoy from Maine and glass floats from Japan doesn't it? Strapped some rope around top & it is ready to hang on the wall. Please click the above image to take you to our online store.